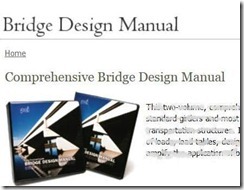 The Bridge Design Manual features background, strategies for economy, fabrication techniques, evaluation of loads, load tables, design theory and numerous complete design examples. The Bridge Design Manual covers both preliminary and final design information for standard girders and most precast and precast, prestressed concrete products and systems used in bridge structures. The book is designed to explain and amplify the application of both the AASHTO Standard and LRFD Bridge Design Specifications. The chapters and the contents in each chapter can be downloaded by visiting PCI website. Click here and -> Download the complete book. This entry was posted in Book Review and tagged Bridge Design, PCI. Bookmark the permalink.